I was born and raised in the small town of Murray at the western end of Kentucky. My father worked in a chemical plant and my mother sold real estate while my older brother and I pursued our interests through our community. For as long as I can remember, I’ve had an abiding attraction to history. I think I found it intriguing because the past was different, and I enjoyed the creative act of imagining other people and places in earlier times. Likewise, I think Europe held an appeal of difference too. 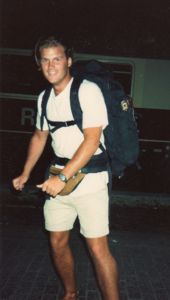 I had friends with European connections and I took French throughout high school, but it was my experience backpacking in Europe as a college student that confirmed for me that the future of my life would be in the past. I graduated from Murray State University, got my doctorate at Rutgers University, and am now a Professor of History at Pacific University in Oregon. My published research has won awards and been supported by grants and fellowships from the likes of the National Endowment for the Humanties, the Fulbright Commission, and the French government, among others. My scholarly interests have circled around the histories of youth and young people, popular culture, travel and tourism, mobility, integration, and transnationality. My teaching runs the gamut of modern European history including the French Revolution, British Empire, Holocaust, and global revolts of 1968. Teaching students has helped me to appreciate how history can inform us about the state of our world and the ways in which the past is relevant to the understanding of our present. From Kentucky, I moved to the New York/New Jersey area, spent a couple of years in Paris, and now live in Portland, Oregon with Kim, Greta, and Ezra. I have taken advantage of the abundant opportunities to drink local beer and wine, although this tends to be true wherever I go. We like to travel around the country and world visiting family and friends as often as we can. 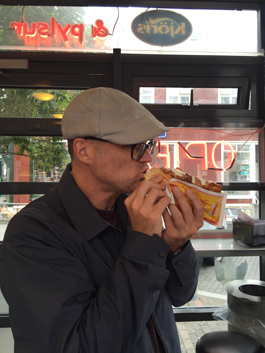 We are all of us explorers eager to try new things, like an elaborate Icelandic pylsa (hot dog).